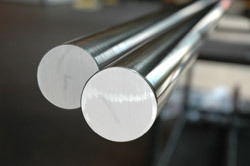 Quality stainless steel (ss) products are a top priority at Best Stainless. Our Stainless steel 410 is a basic martensitic grade which contains 11.5% chromium, offering both exceptional wear and corrosion resistance. SS 410 is corrosion resistant to some chemicals, food, mild acids, water, and air. It also proves adequate resistance to nitric acid, concentrated sulfuric acid, dilute acetic acid and naphtha. Elevated mechanical properties and corrosion resistance are achieved with stainless steel 410 when it's hardened and tempered. Our 410 stainless steel can be used in applications such as dental and surgical instruments, pipelines, valves and nozzles, automotive parts and more. 410 SS is generally used for applications which involve mild corrosion, high strength, and heat resistance. Depending on the application and performance requirements we also provide 410 stainless steel casting equivalent, CA15. Our stainless steel bar stock lengths range from the industry standard 12' to 28' long. For projects requring long length stainless steel bar, our inventory ranges from 20’-28’ R/L. Martensitic grades are all heat treatable grades. Type 410 stainless can be hardened to range of 35-39 RC. Please contact us to discuss your particular heat treat requirement specifications.